Forget the massacre of fan wallets that lay ahead, DC top brass must be taking another leaf out of Hannibal Lector's book, and kicking back after the breaking of today's news to toast all it's awesome possibilities with a nice Chianti. 52 brand-spanking new #1 issues will re-launch the DC universe to readers new and old this September, no easy feat when you are talking about characters, titles and universes that have been around longer than many of us have been alive. 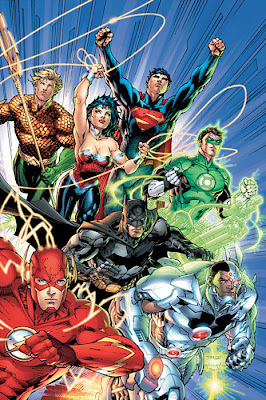 With a 'all-star' Justice League #1 leading the charge, by writer Geoff Johns and artist Jim Lee, I wouldn't be suprised if this isn't the only dream creative team meets concept combo waiting to be announced (Go Cyborg)! Sure change 100% approved in comic-fan-land is as rare as a hair follicle on Lex Luthor's head, but the possibilities of concepts this presents is just to wild to let that emotion stand in the way - especially from these early stages. This is your opportunity to get behind the ones you love, stick around after the #1-mania wears off, and show DC there's enough ground support behind this guy, gal or group to leave the power on and keep that series printing. Martian Manhunter, Kamandi, The Spectre, Plastic Man, The New Gods, Adam Strange, Captain Marvel, DOOM Patrol, Suicide Squad, Dr Fate, Mr Miracle, Jimmy Olsen, Vixen - heck even Ambush Bug! Any DC character from the vault could get the green-light. First Flashpoint, then this? While I will be blogging on this quite closely, DC's old tag-line used to be "The New DC - There's No Stopping Us Now!" Suddenly after today's news, it's not just the characters that seem new again. all the DC fans all over the world are gonna make all this Hell thats busted loose all over the Middle East since February look like a big block party in comparison. When I saw your blog headline, I genuinely laughed out loud. The boards are a jungle. BTW Fabian said on the DC forums tonight that he is not writing Teen Titans. You can see the link to the original thread in the Teen Titans forum. AMBUSH BUG!!!!!!! I want Ambush Bug! That was a sick, demented, hilarious book. Not sure I love the idea of yet ANOTHER re-re-re-re-re-boot, but I gotta say, that's the best postt title I've seen in a LOOOONG while! This has soo much promise in it! I'm looking forward to it! Not that I like mass reboots either, but it will be interesting for sure. Wow - thanks for all the great comments folks! Just remember if anyone makes a parody video of that scene I get royalties!! Welcome to IADW BlackEmerald! I have to say the age of what Superman looks like in that image concerned me at first glance too but maybe that's just perspective or even Superboy? Who knows, bias says Supes should be one of the older heroes but I'm still interested to see how things spin out in the wash.
ToB thanks for pointing that out! Sad because it would've been a brilliant match-up... I used to visit the DC Forums allot but then they became a troll attracting negative and sometimes vicious place and I've yet to be back. Hopefully that's changed as the fan debates and what if convo's this kind of ballsy move creates need a great venue to hold great conversations - don't you think? So excited by this I am, DC is actually beating Marvel at their own game. DC used to be the one seen as stationary and plodding along while Marvel seemed to have a path direction and open to taking large risks with the Ultimate line, Marvel Knights and their characters, but now with Blackest Night, Flashpoint, and now the 52 #1's it seems like its DC who are working to a major path and shaking things up, while Marvel is holding the status quo. Not that there's so much wrong with that - just interesting to see the wheel turn. I hope you will do a 'Silence of the Fans' post on June 13!